DIY Folks, Here is an intelligent LCD display, 240 x 128, which is easy to use and implement within your various constructs and devices. It is the EA eDIP240-7 – the world’s first display with integrated intelligence! As well as a number of builtin fonts which can be used with pixel accuracy it also features a whole range of sophisticated graphics functions. integrated RS-232, SPI or I²C interfaces. Graphics commands similar to high-level languages are used for programming. There is no longer any need for the time-consuming programming of character sets and graphics routines. The ease of use of this display with its touch panel reduces development time dramatically. The display is designed to work with an operating voltage of +5V. Data transfer is either serial and asynchronous using the RS-232 format or synchronous using the SPI or I²C specification. A simple protocol is used for all data transfer variants to improve data reliability. labeling of the “keys” is flexible and can also be changed during runtime (different languages, icons). The drawing of the individual “keys” and the labeling is handled by the integrated software. 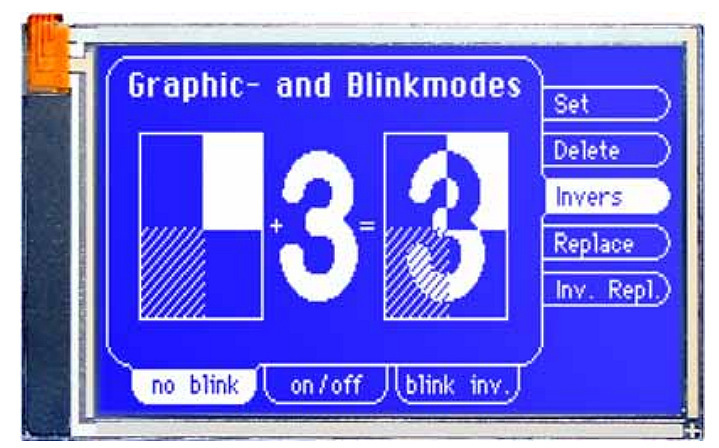 All displays in blue-and-white (B) and black-and-white (J) are equipped with a modern, low power consumption LED backlight. Whereas the black&white and the amber-colored display can still be read even when the backlight is switched off completely, the blue-white display requires a minimum level of illumination to be legible. The backlight can be switched off with a software command and the brightness can be adjusted. The manufacturer recommends the black&white version for use in direct sunlight. For all other applications, he recommends the high-contrast, blue-white version. Note that the white LED backlight is subject to aging. That means switching off or dimming backlight is a must for 24-hour-applications. Not so for the amber backlight. The display is programmed by means of commands, such as Draw a rectangle from (0,0) to (64,15). No additional software or drivers are required. Strings can be placed with pixel accuracy. Flashing attributes can be assigned as often as you like – for graphics as well. Text and graphics can be combined at any time. Up to 16 different character sets can be used. Each one can be zoomed from 2 to 4 times. With the largest character set, the words and numbers displayed will fill the screen. 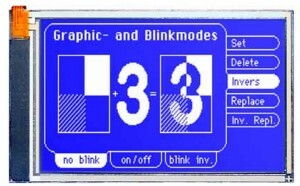 The display is supplied fully programmed with a complete set of fonts. The additional programming is thus generally not required. If, however, the internal character sets are to be modified or extended, or if images or macros are to be stored internally, the additional EA 9777-1USB-programmer, available as an accessory) will permanently write the data you create to the onboard EEPROM (32 kB). The Programmer runs under Windows and is connected to the PC’s USB interface. A power supply is not required, and an interface cable are supplied together with the programmer.